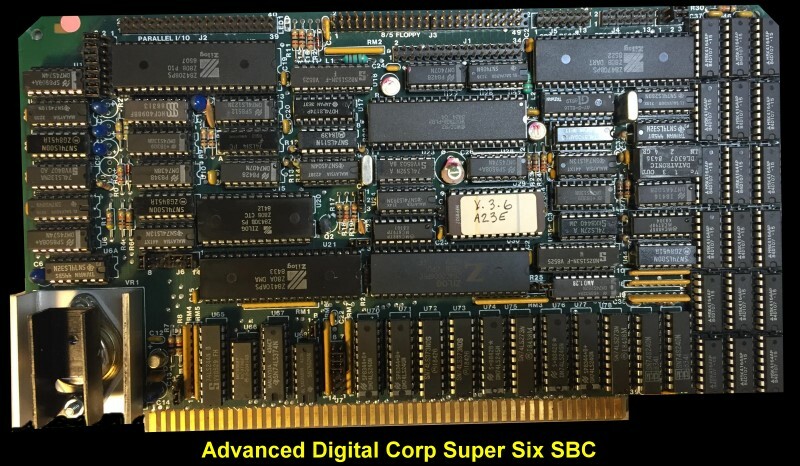 This was Advanced Digital Corp's improved version of their Super-Quad S-100 board. It was a very densely packed Z80B (6MHZ) based SBC. This board was IEEE-696 compatible and had 128K of dynamic RAM on board. This memory could be banked selected or extended addressing. There was a Western Digital FDC chip capable of talking to both 8" and 5" drives. It had an onboard DMA controller. There were two serial ports (Zilog SIO), two parallel ports (Zilog PIO) and a clock/timer chip (Zilog CTC). There also was room on board for up to 4K of EPROM. ADC provided drivers for CPM V3.0, MP/M and Turbo-DOS. The board was meant to primarily serve the ADC Super-Slave Z80 CPU boards in a multi-user system, but of course it could be run in any S-100 system by itself. The manual for this great looking board can be obtained here. The example BIOS listing provided by ADC can be obtained here.